On the sidebar are a few links for General Assembly. As I make posts I will drop them over yonder. You will also find links to the basics: More Light, Presbyterian Voices for Justice, CovNet, That All May Freely Serve, Outlook, the official GA site, Twitter, and PC Biz (business before the assembly). If you think of others I should add, let me know. I won't add links to the fundie sites. I will channel information from them to you via my special voodoo that I do. This is nice. We have a group at our church called "knitting for charity." They come together, they knit, they give it away. 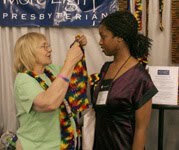 When I announced on More Light Sunday about knitting scarves for the commissioners through More Light Presbyterians, I didn't hear anything about it. That is, until today when they presented me with eight beautiful scarves. They are on their way to the More Light booth via one of our commissioners. So More Light folks, please look for them. I didn't get a chance to label them but you will know they are from us as they are in a East Tennessee State University bookstore bag! Some presbytery staff are blogging on the GA. Jeanne Radak from Philly Presby is doing so. A different perspective but not fundie. You might check other presbys too. And I bet some YADs will blog too. Also the Moderator and Stated Clerk of the Evangelical Presbyterian Church of Togo are Ecumenical Delegates this year. Let me see if they will put up their perspective. If I find out they do I'll let you know. You probably know this but for those who don't Evangelical in South America and Africa simply means protestant. Looking forward to the voodoo channel reports. John M are you referring the the folks from the EPC of Togo. If so suggesting that are involved in Voodoo just because they come from Africa is insulting! "I won't add links to the fundie sites. I will channel information from them to you via my special voodoo that I do. " I was looking forward to Shuck's voodoo channeling of the actions of our fundie brothers and sisters within the PCUSA. OOPS! Sorry about that. I a bit defensive about folks from Africa because of all the crap they are getting in the community and in the PCUSA.